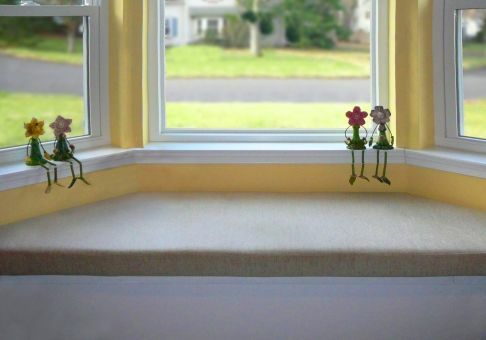 Custom bay window cushions are a perfect fit for any trapezoid window seat. Choose from thousands of our fabrics or send us your own. 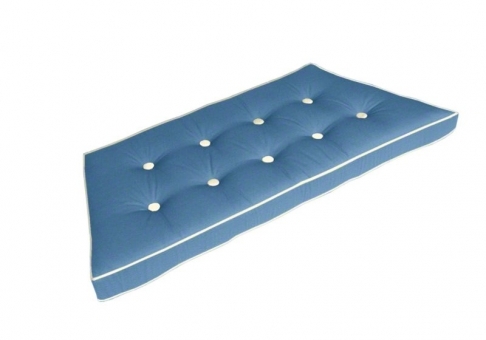 Indoor bay window cushions can be ordered in any size to fit your spot. If your seating area is a unique or odd shape, simply create a paper template of the desired size and shape, and we will use it to create your special cushion. 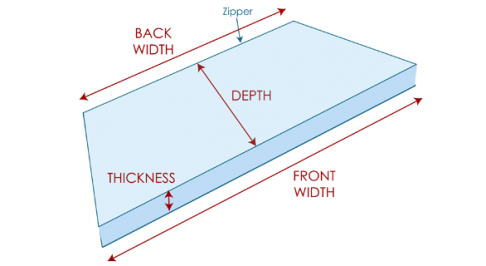 Bay window cushions are most often trapezoids. 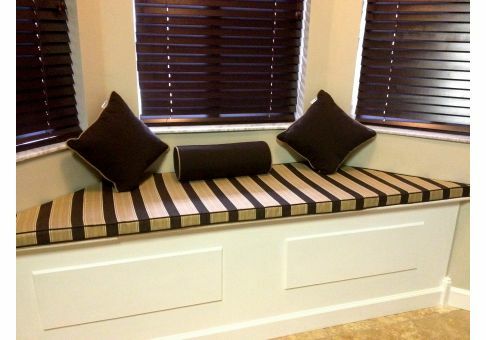 If your window seat is a rectangle, please design your cushion from our selection of window seat cushion styles. 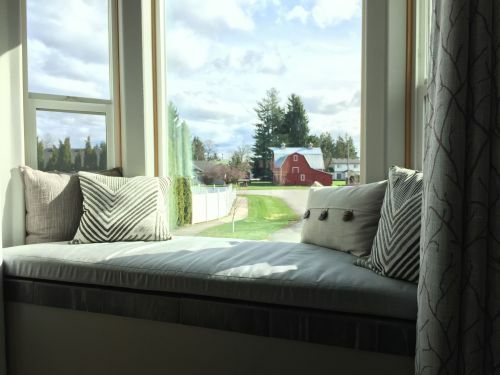 Our bay window cushions include a coordinating zipper along the back side, and the finished product will be within ½" of your provided dimensions. Design your bay window cushion with or without decorative buttons and choose from multiple fill types to best suit your needs. 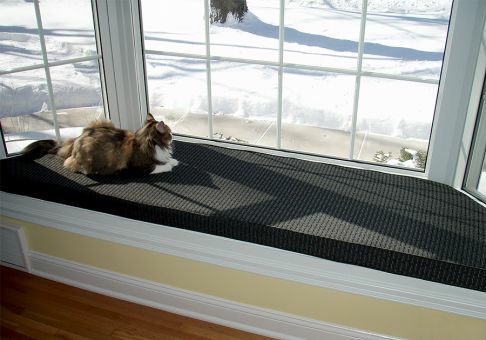 You may also add ties to keep your bay window seat cushion in place. When made with durable, fade-resistant fabric, your bay window cushions can last through years of sunlight, spills, and use. 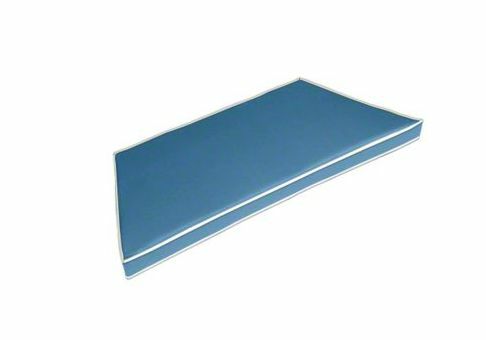 Although designed for outdoor use, solution-dyed acrylic fabrics are soft and stylish enough to use indoors. 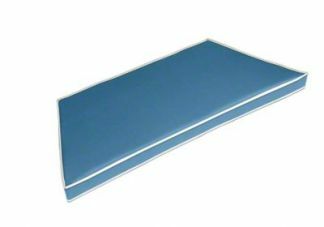 These fabrics, such as Sunbrella, Outdura, PARA Tempotest, and select Robert Allen fabrics, carry warranties against fading from the sun - an important factor when your trapezoid cushion spends its time in front of a window. Plus, these outdoor fabrics are hard to stain and easy to clean. Order fabric samples to make sure the colors in the fabric(s) are what you need. Take your measurements very carefully. Remember the old carpenters' rule: Measure twice; cut once. If your cushion is an odd or unique shape, no problem, simply create a paper template for us to make your cushion to the shape you need! Choose your fabric(s), enter your dimensions, select edge style and fills, and place your order. We get to work on your beautiful new window seat cushion, and it will arrive on your doorstep in 3 to 4 weeks! Check out some of our customers' photos of their beautiful new bay window cushions. Get started with your order today!